Scholarships are available for each session. 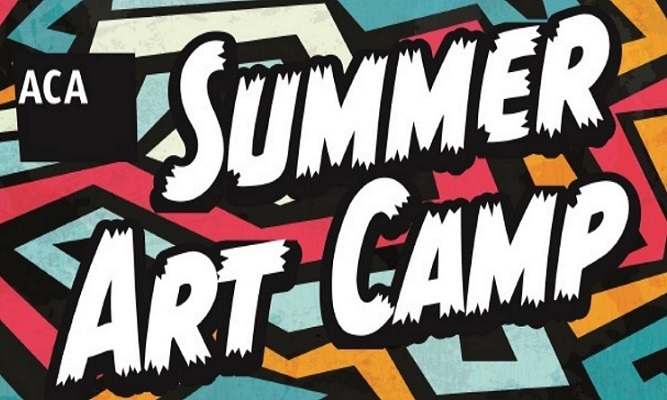 Painting, music, dance and more – kids love Summer Art Camp at Atlantic Center for the Arts! Modeled after ACA’s world-renowned artists-in-residence program, each one-week session features three classes that give campers an opportunity to explore ideas of art and culture through hands-on experiences with a variety of art forms, including paper maché, painting, photography, yoga, drumming, dance, theater and more. Camp administrator Miss Peggy is looking forward to a great summer! Click here to complete online form. You will receive an invoice from ACA after this registration form is reviewed. GENERAL INFORMATION – Atlantic Center for the Arts’ Summer Art Camp is held at ACA Downtown: Yurick Studios, 123 Douglas Street, New Smyrna Beach. Each weekly session in the seven-week program features three classes that give campers an opportunity to explore ideas of art and culture through hands-on experience with a variety of art forms. There is downtime for snacks, stretching, games, and lunch. Participants will meet new friends and take-home artwork every week. The Young Masters exhibit in ACA Downtown: Harris House Gallery will feature artwork made in camp. Age – Children must be between 6 years old (or have completed kindergarten) and 12 years old. Registration & Payment – Registration is on a first come, first served basis. Full payment of tuition is due ten days before the first day of the session for which your child is registered. Wait List – If a session reaches 30 participants, ACA will create a wait list. Wait listed families will be contacted up to 4 PM on the Monday of that session if space opens. Scholarships – Financial aid is available for students in need of assistance. Scholarships are awarded on a first come, first served basis, for as long as funds are available. Full scholarships are only awarded in cases of extreme hardship. Materials – The camp fee covers the cost of all materials. Occasionally, instructors may ask children to bring in special items for a project such as copies of family photos or blank CDs. Drop off & Pick up – On the first day of each session, please arrive at ACA Downtown: Harris House between 8:30 AM and 8:45 AM to finalize registration. After the first day, please arrive to the back of ACA Downtown: Harris House between 8:30 AM than 8:50 AM. Parents may wait until their children are escorted to their respective classes if they choose to do so. Camp Classes end at 2 PM. Children should be picked up by 2 PM at ACA Downtown: Harris House. Children must be signed in and out by their parent or guardian each day. Parents are required to provide notice for early/late drop off or pick up, and the full name of individuals who are authorized to drop off or pick up. Changes must be submitted in writing. Lunch & Snacks – Students must bring their own lunch and snacks in containers with their names clearly written on the outside. Lunches will not be refrigerated. Health Concerns & Allergies – Parents must advise us of any health concerns including, but not limited to allergies. It is important for us to be apprised of any behavioral or medical issues. This information is held in the strictest confidence by ACA staff and is only available to camp instructors at staff discretion. Disabilities Policy – It is ACA’s sincere wish that our programs be open and accessible to all participants, regardless of ability. ACA is open to enrollment of camp participations with disabilities on a trial basis. This is done with the understanding that some participants may require the presence and assistance of a parent or guardian to provide additional assistance. If at any time ACA staff feels that the participant is experiencing ongoing challenges or difficulties in the camp environment that have a disruptive effect on the group, ACA reserves the right to ask that participation be discontinued. Refund Policy – In cases of registration cancellation, a refund of the full tuition, minus the $30 non-refundable deposit must be requested one week prior to the first day of the session. Gift Certificates – Gift certificates must be paid in full, for the full tuition amount. ($105 ACA members/$130 nonmembers) member status refers to the purchaser of the gift certificate (not the recipient) at the time of purchase. One gift certificate = one child, one session.